There are no comments for Breaking Dawn. Click here to post the first comment. 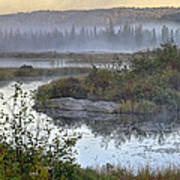 A misty dawn breaking over one of the many lakes and rivers in Algonquin Provincial Park, Ontario, Canada. Algonquin Park was named a National Historic Site of Canada in 1992 in recognition of several heritage values including: its role in the development of park management; pioneering visitor interpretation programs later adopted by national and provincial parks across the country; its role in inspiring artists, which in turn gave Canadians a greater sense of their country; and historic structures such as lodges, hotels, cottages, camps, entrance gates, a railway station, and administration and museum buildings. The beauty of Algonquin Park attracted artists such as Tom Thomson along with members of the Group of Seven, who found the landscape inspiring. Thomson served as a guide in the park, often working from Mowat Lodge. 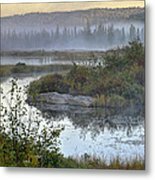 He did much of his painting at Canoe Lake, and a favourite campsite of his was behind Hayhurst Point, a peninsula overlooking the central portion of the lake.